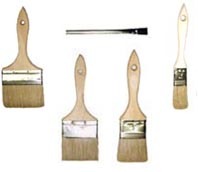 Bristle Brushes - Unpainted sturdy wood handle, with natural bristles. Ideal for epoxy work. Ferrules are securely fixed to the handles.